Dorsal view of Leobodes anulatus, from Norton & Behan-Pelletier (2009). The Nippobodidae are a group of oribatid mites found in eastern Asia characterised by large projections on both the prodorsum and the anterior of the notogaster. Characters (from Norton & Behan-Pelletier 2009): Length 600–750 µm. Prodorsum with large processes in middle portion; with true lamellae. Subcapitulum diarthric; chelicerae chelate-dentate; subcapitular mentum without tectum. 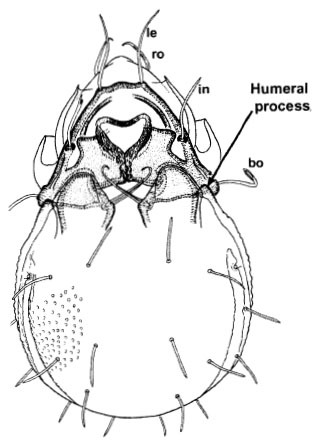 Notogaster with large subtriangular or subrectangular humeral processes projecting dorsally over bothridium, interlocked or not with prodorsal processes; octotaxic system absent.